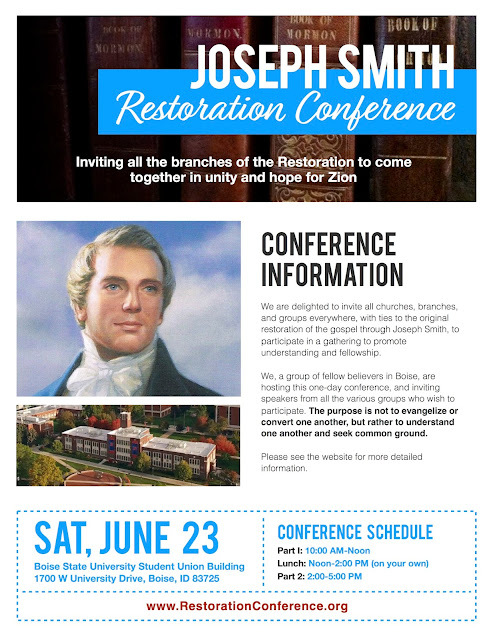 Someone has noticed the need for a small, introductory handout for the restoration movement, to provide a basic introduction and background to any who may be interested. Ideally, it should be compact enough to be conveniently carried in a mobile phone case or checkbook, so it's available when needed. The good news is someone has created just such a handout. They have printed some and will mail a few at no charge to anyone who sends their name and address to john@utahtt.org. I had nothing to do with this effort, but I think it is worthwhile and helpful, so I agreed to publicize it here. This handout attempts to show the pattern throughout history of truth being revealed and then repeatedly corrupted so that there must be a movement, like the Protestant Reformation, to return to the original. It attempts to be non-offensive to both Christians and LDS and yet it also points out some of the problems that cause the need to preserve the restoration. You can download a PDF of the document here. It is designed to be printed on 8.5 x 14 inch paper, cut down, and multi-folded. The numbered panels are to be read in order. NOTE: This document is not, and has nothing to do with, the Guide & Standard/Statement of Principles project. This is not a statement of principles, nor is it a guide and standard; rather it is merely a historical introduction to the Lord's work, useful as an introduction.